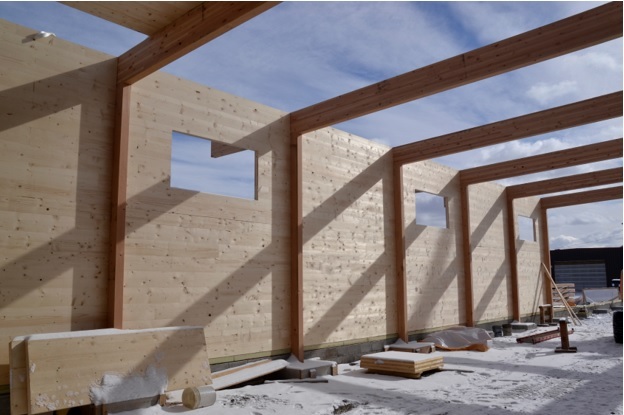 This Pro Tour will bring attendees to the first complete CLT (cross laminated timber) building in New York State, a 21,000 sq. ft. project that will be the latest addition to the commercial campus of New Energy Works & Pioneer Millworks. Known as Tomorrowland, this new commercial facility was created in the wake of a catastrophic building failure in Feb '15. When it was time to plan for a replacement for the original post-WWII structure, the company saw an opportunity to build the first full timber and CLT building in New York State. The team at New Energy Works sees CLT construction as the wave of the future, offering possibilities for both businesses and housing with dramatic environmental benefits. The timber frame structure has been designed, engineered, and finely tuned to integrate with the CLTs. The front and rear porch roofs will be constructed of peg and nail laminated timbers that will be manufactured from reclaimed wood on the neighboring timber shop. The major axis of the building runs north / south allowing for a long section of windows in an east facing clerestory. This will allow significant natural light to supplement the interior LED lighting. Tomorrowland will be the new home of New Energy Work’s fine woodworking division and offer a bit of storage/shipping space for their sister company, Pioneer Millworks Reclaimed Wood. During the event, the company will tell the story of how they handled the building collapse, the aftermath, and the insurances, creating a secondary business learning opportunity for attendees. The team is excited to bring this alternative building method to the region, to share insights gained from the design and construction, and give Pro Tour attendees a chance to see and feel the CLT wood.